Donald Trump plans to make immigration and “border security” the dominant themes in the 2018 midterm election. On June 24th, Trump tweeted: “We need strength and security at the Border!… We cannot allow all of these people to invade our Country. When somebody comes in, we must immediately, with no Judges or Court Cases, [send] them back.” To respond effectively, Democrats need to tell the truth about immigration; they need to respond to 10 questions. The reality is more complicated. Most of the recent immigrants coming across the southern border are fleeing the “Northern Triangle” of Central America (El Salvador, Guatemala, and Honduras) because their lives are in danger; they’re seeking asylum in the United States. There’s no compelling evidence that these immigrants are criminals (https://www.nytimes.com/interactive/2018/03/30/upshot/crime-immigration-myth.html). (2) How many are crossing the southern border? Trump routinely calls the influx of immigrants “a crisis” and implies it’s a deluge. (3) Is this a crisis? From the moment Trump announced his presidential candidacy, he has used inflammatory immigration language to describe a border “crisis.” In June of 2015, Trump blamed Mexico: “When do we beat Mexico at the border? They’re laughing at us, at our stupidity. The U.S. has become a dumping ground for everybody else’s problems… When Mexico sends its people, they’re not sending their best. They’re sending people that have lots of problems… They’re bringing drugs. They’re bringing crime. They’re rapists…” Nonetheless, a recent Bloomberg article indicated that immigration from Mexico isn’t a problem (https://www.bloomberg.com/view/articles/2018-06-26/what-immigration-crisis-the-u-s-isn-t-being-swamped) — there are more Mexicans leaving the U.S. than there are those coming in. Early on, Trump also claimed that Islamic terrorists were pouring across the southern border; he’s since dropped this assertion. On June 24th, the New York Times investigated whether there is an immigration “crisis” in the border town of Brownsville Texas (https://www.nytimes.com/2018/06/23/us/border-trump-immigration.html) and concluded there isn’t. At the moment, the border is, in effect, closed to asylum seekers and so the vast majority of them have no legal way to enter the U.S. In many cases, they cross the border anyway. When they are apprehended they are taken into custody and charged with a misdemeanor and jailed. 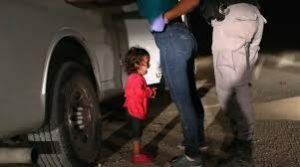 (That’s the effect of the Trump Administration “zero tolerance” policy.) They are then held indefinitely until they appear before an Immigration judge. The Trump Administration routinely alleges that immigrant children are gang members or are being manipulated by gangs. A recent New York Times article indicated there’s no credible evidence of this (https://www.nytimes.com/2018/05/01/us/immigration-minors-children.html). (7) What rights do immigrants have? The Constitution guarantees basic rights to anyone who is in the United States — whether or not they are citizens. Immigrants are guaranteed the right of due process (https://www.pbs.org/newshour/politics/what-constitutional-rights-do-undocumented-immigrants-have); that is, they can have their day in court. (9) Do immigrants have the right to post bond? Yes, but most of them don’t have the wherewithal to do this. A June 24th New York Times article (https://www.nytimes.com/2018/06/23/us/family-reunited-border-immigration.html ) described the case of a Guatemalan woman who was separated from her son but who was aided by the organization Libre by Nexus; they gave her legal advice, put up her bond, and instituted a lawsuit that resulted in reconciliation. On June 23rd, the Trump Administration announced a process to reunite the 2053 “separated minors,” it has in custody, with their parents. As part of this process, the Department of Justice will seek to revoke the Flores decision so that it can hold minors, and their parents, indefinitely. Summary: Not surprisingly, Trump has exaggerated and lied about the immigration situation. It’s not a crisis. The vast majority of the immigrants are not criminals, they are unfortunates legitimately seeking asylum. The solution to the situation is to grant immigrants due process and, for legitimate asylum seekers, releasing families from custody until they can have their day in court. 515 days into Trump’s presidency, three things are clear: Donald’s signature issue is division; he always plays to his base; and his primary issue is immigration. Trump promised his base a wall along the southern border and he’s willing to do anything to accomplish this. His most recent tactic is to generate outrage by separating immigrant families at the border. The architect of this tactic is Stephen Miller. In his ongoing effort to solidify and energize his base, Trump has pursued a consistent set of campaign issues: immigration; trade; taxes; and energy. Trump’s most significant failure has been his inability to secure funding for his border wall. Meanwhile, Trump’s base has gotten restless. One of his most notorious supporters, Ann Coulter, has mocked Donald for failing to deliver on his border-wall promise ( http://thehill.com/blogs/blog-briefing-room/news/380612-ann-coulter-trump-is-a-shallow-lazy-ignoramus). Despite Administration efforts, illegal border immigration increased in May. (https://www.nbcnews.com/news/us-news/despite-trump-admin-crackdown-illegal-immigration-border-increased-may-n880686 ) Trump seized on the tactic of separating immigrant families at the border in order to outrage Democrats and, in effect, blackmail them into providing funds for his wall. This is also an effort to galvanize Trump’s base before the 2018 midterm elections. Trump had planned to excite them with tax cuts but this hasn’t worked — the base has figured out that the Trump tax cuts don’t help them. Stephen Miller is the architect of the tactic of separating immigrant families at the border. (Miller was also the architect of Trump’s January 2017 executive order restricting immigration from seven predominantly Muslim countries.) 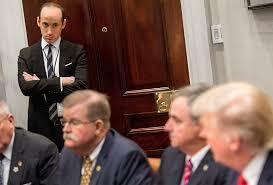 The 32-year-old Miller has several White House jobs: he advises Trump on domestic policy, particularly immigration and trade; he helps write Donald’s speeches; and when Trump hits the campaign trail, Miller goes with him as an opening act — he fires up the base with an incendiary monologue. Stephen Miller is Trump’s closest adviser who is not a member of Donald’s family. (Miller serves in a White House position that is roughly equivalent to that of Valerie Jarrett in the Obama administration.) There are those that say Miller’s function is to articulate Trump’s impulses. One of the notable similarities between Trump’s signature immigration actions (restricting immigration from seven predominantly Muslim countries and separating immigrant families at the border) is how sloppy the implementation was. For example, there’s every indication that when immigrant parents are separated from their children, the government is not taking steps to ensure they can be reconciled later. This appears to be intentional. Stephen Miller and Donald Trump are not motivated by civility or legality. They want to generate outrage; foment division. 511 days into the Trump presidency it’s clear that Donald is the most destructive US President in recent history. He’s divided the nation, alienated our historic allies, and made worse the planet’s most pressing problems. Although there are several possible explanations for Trump’s disastrous behavior, it’s likely that he is acting on behalf of Russia. The overall state of the nation has deteriorated under Trump. (The latest Pew Research Poll indicates that 62 percent of respondents are dissatisfied “with the way things are going.”) A recent report ( https://thinkprogress.org/u-s-developed-world-income-wealth-inequality-un-report-788b1300e4be/) found that: “the United States is leading the developed world in income and wealth inequality;” and placed the blame at the feet of the Trump Administration. (For example, Blue-collar wages are down (https://www.motherjones.com/kevin-drum/2018/06/chart-of-the-day-blue-collar-wages-are-down-under-trump/ ).) Trump has jeopardized American democracy. Why Trump is doing such a terrible job? One answer is that he isn’t up to the task; he lacks the intellectual and emotional strength to be President. And it doesn’t help the situation that many of Washington’s “best and brightest” don’t want to work for Trump; as a result he has a thin and second-rate staff. Another explanation is that Trump is obsessed with eradicating the legacy of Barack Obama — Donald wants to be the anti-Obama. Therefore his legislative agenda is to reverse Obama initiatives. Obama was for affordable healthcare; Trump pushed to overturn “Obamacare.” Obama signed the “Deferred Action for Childhood Arrivals” policy; Trump reversed it. Obama signed the Iran Nuclear Accord — the “Joint Comprehensive Plan of Action;” Trump unilaterally withdrew. Obama signed the Paris Climate Agreement; Trump plans to withdraw. In other words, if Obama was for it, Trump is reflexively against it. Trump has a negative agenda. A third, more sinister explanation is that Trump is a puppet. The question is who is pulling the strings? One theory is that Trump is controlled by a small group of Republican oligarchs including Sheldon Adelson, Robert Mercer, and Charles and David Koch. This might explain some Trump actions, such as moving the US embassy in Israel from Tel Aviv to Jerusalem — a key Adelson issue. However it does not explain many Trump actions such as the crackdown on immigrants, particularly the Trump’s reversal of the “Deferred Action for Childhood Arrivals,” which the Koch’s oppose. Another theory is that Trump is beholden to Vladimir Putin and Russian Oligarchs. Under this line of reasoning, Putin and his inner circle are calling the shots; Trump goes along with them because he has no choice. There are many Trump actions that support the notion that Putin is telling him what to do. The most obvious is Trump’s attitude towards Russia. For example, even though there’s indisputable evidence that Russia interfered in the 2016 election, Trump refuses to acknowledge this ( https://www.cnn.com/2018/02/13/politics/trump-unconvinced-russia-meddled-election/index.html). 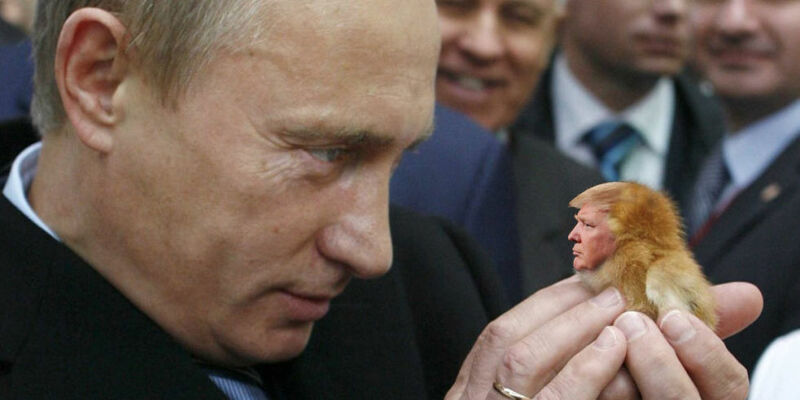 Even though it appears to many observers that Russia is at war with the US — cyberwar — Trump continues to cozy up to Putin. (Recently Putin told an Austrian news outlet that he talks to Trump “regularly.” (https://www.cnbc.com/2018/06/05/putin-says-he-talks-to-trump-regularly.html )) Trump recently declared that Russia should be brought back into to the G-7 discussions. (They were expelled after the invasion of Crimea.) He plans to invite Putin to the White House. Given that Putin is controlling Trump, what is Putin’s strategy? There appear to be three aspects. The first is to use Trump to weaken western alliances: the United Nations, NATO, the G-7, etcetera. There’s no doubt that Trump has done this; the most recent example being the June G-7 meeting where Trump left early and refused to sign the group communique. US global military alliances have also been weakened. For example, Trump just called off the annual United States-South Korea military exercises — something that was requested by North Korea and Russia. Trump has weakened US alliances in general. By withdrawing from the Paris Climate accord, Trump signaled that the United States will no longer work with the rest of the world on climate change issues. By withdrawing from the Iran Nuclear Accord, Trump indicated that he reserved the right to act unilaterally throughout the world. Now, Trump has shaken up trade relations with America’s largest trading partners (the European Union, China, Canada, Mexico, Japan, South Korea…). Trump has drastically curtailed the US role in all global endeavors such cybersecurity, health, immigration, tourism, etcetera. Putin also wants to weaken the relationship between the United States and the European Union. From the onset, Trump has disparaged the EU by actions such as supporting Brexit and demonizing Germany. As a result our EU partners no longer trust the US. Finally, Putin wants to weaken US democracy, weaken our resolve. There’s no doubt that Trump has divided the country and as a consequence turned us inward, diminished our role as a global power. When I was a technology developer, in Silicon Valley, I adopted the technique of “managing by walking around.” Recently I’ve talked to two outstanding 2018 Democratic political candidates who’ve adopted this same technique in their campaigns. While it may not be obvious, “politics by walking around” addresses one of 2018’s burning political questions: what does the Democratic Party stand for? 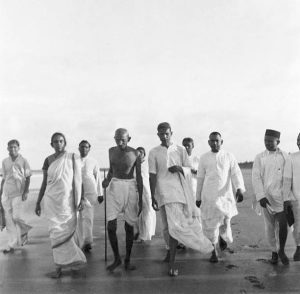 In fact, “managing by walking around” is a technique long-used by community organizers. 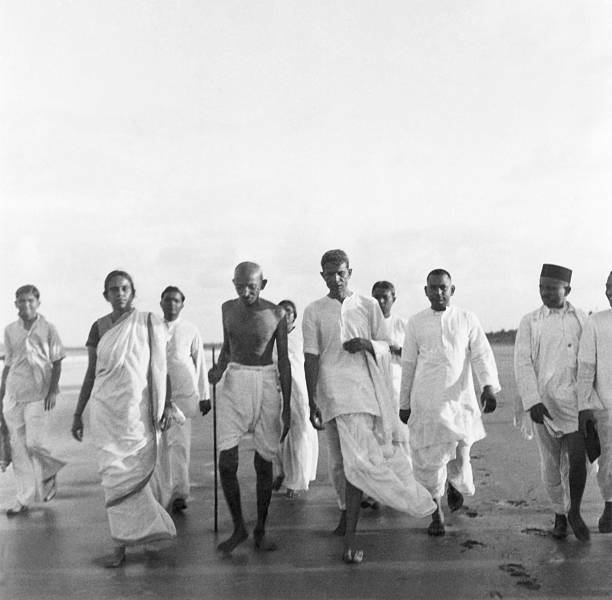 After returning to India in 1915, Mahatma Gandhi would routinely leave big Indian cities and walk through the sprawling countryside visiting village after village, talking to peasants about their concerns. Barack Obama used this same technique when he was a community organizer in Chicago in the 1980’s. The basic notion in “managing by walking around” is that one stands a better chance of understanding what is going on by getting out of the office and going to visit folks where they live or work. Interestingly enough, that’s the technique being used by two formidable 2018 Democratic candidates: Stacey Abrams, who is running for Georgia governor, and Beto O’Rourke, who is running for Senate in Texas. If you talk to O’Rourke, you won’t know that he is an underdog. So far he’s raised more money than Cruz. And he’s made himself more visible by traveling to each of Texas’ 254 counties — often going to communities where in recent memory no Democrat has visited. As we approach the critical November 6th midterm elections, many Democrats lament the absence of a unifying national theme. The Dems most recent attempts targets Trump’s culture of corruption ( https://www.nbcnews.com/think/opinion/democrats-new-2018-strategy-targeting-trump-s-culture-corruption-missed-ncna880006). The campaigns of Stacey Abrams and Beto O’Rourke indicate that rather than adopt some abstract national theme, state and congressional Democratic candidates should instead practice the politics of walking around. Democrats should talk to their constituents and run on their concerns, which differ from state to state and district to district. The Trump Administration is so dreadful they’ve made the George W. Bush Administration seem almost acceptable in comparison. Dubya surrounded himself with qualified staff. Trump has surrounded himself with syncophants. One of the most influential is the new Secretary of State, Mike Pompeo. Unlike many of those in the Trump inner circle, Pompeo had an impressive career before entering politics. After graduating from West Point — number one in his class — Pompeo served five years in the Army. Then he went to Harvard Law School and briefly worked for a Washington law firm. In 1996, he moved to Wichita, Kansas, and helped form Thayer Aerospace — with funding from the Koch brothers. In 2006, he was elected to the House of Representatives — once again with help from the Koch brothers. In Congress, Pompeo aligned with conservative Republicans such as the Tea Party and the Congressional Constitution Caucus. He’s socially conservative, a climate change denier, and, as a member of the House Select Committee on Benghazi, an ardent critic of Hillary Clinton. On January 23, 2017, Mike Pompeo became Trump’s Director of the Central Intelligence Agency. 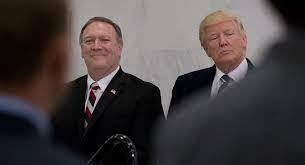 Notably, Pompeo personally delivered Trump’s daily intelligence briefing at the White House; as a result, the two men have a close relationship. At the moment, Mike Pompeo probably has more influence on Donald Trump’s foreign-policy actions than does anyone else in the Administration. In most regards, Pompeo’s stated beliefs align with Trump’s. North Korea: Pompeo has been Trump’s point man on negotiations with North Korea — Trump sent Pompeo to negotiate with Kim Jong-un before Pompeo was confirmed as Secretary of State. At this writing, Pompeo is meeting with North Korean representatives. He says the negotiations are “making progress” but does not know if a June 12th meeting between Trump and Kim Jong-un will occur. Iran: Pompeo has long been opposed to the Iran nuclear agreement –technically the “Joint Plan of Action” (JPA) signed November 24, 2013 . As a Congressman, Pompeo said, “I look forward to rolling back this disastrous deal with the world’s largest state sponsor of terrorism.” On May 8th, Trump declared he was withdrawing the United States from the JPA. Trump wants to negotiate a new JPA that specifically limits Iranian missile testing, gives inspectors unfettered access to Iranian military bases, and extends the (old) JPA’s expiration date beyond 2030. It’s unlikely that either Pompeo or Trump can gain the support of the other signatories: China, England, European Union, France, Germany, Iran, and Russia. China: To a lesser extent, Trump’s attitude toward China has also been inconsistent. Pompeo is a China hawk. In January, Pompeo told the BBC that China is as big a threat to U.S. Security as Russia is, citing efforts by the Chinese to steal American commercial information. Strategic Alliances: Trump has also been inconsistent with regards to support for NATO. Pompeo has been more conciliatory but echoes the White House mantra that our European allies should spend more on defense. Global Climate Change: While many statesmen believe that Global Climate Change is a national security threat, Trump and Pompeo do not agree. In 2013, while still a congressman, Pompeo said, “There are scientists who think lots of different things about climate change. There’s some who think we’re warming, there’s some who think we’re cooling, there’s some who think that the last 16 years have shown a pretty stable climate environment… Federal policy should be about the American family, not worshipping a radical environmental agenda.” Pompeo opposed regulation of greenhouse gas emissions and efforts to bolster “clean” power. Summary: Pompeo is more capable than most of Trump’s inner circle. Nonetheless, he’s a fellow-traveler, a close associate of the Koch brothers. Pompeo’s role is to ensure that Trump’s policies align with those of the Republican oligarchs.